Hello friends, wish you all a very very HAPPY NEW YEAR 2011!! I baked these cookies yesterday but I could not post the recipe. So here I am sharing this with you today. 1. Add the butter in flour and mix it. 2. Kneed the flour well with fingers. 3. Make the small balls(8-10 balls). 4. Flatten the balls with fork and shape it. 5. Sprinkle some jeera and ajwain on each cookie. 7. Grease the baking tray and dust it with some flour. 8. Place cookies on the baking tray by maintaining some gap among them. 9. Bake the cookies for 10-12 min. at 180 degree. 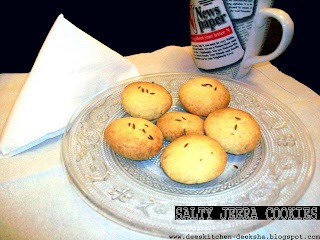 Tasty cookies:) I love jeera and these should have tasted awesome! I prefer salty cookies. Thanks for the recipe.